Thanks to super speedy Steve for the pic! 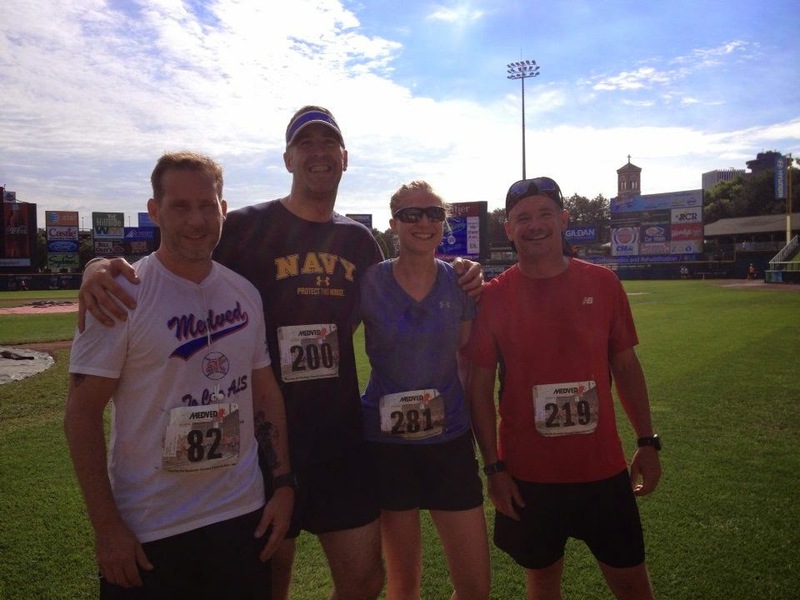 I can't remember the last time I ran a 5K and I haven't done much road running or any speed workouts in a long time. So I didn't know how this race was going to go and I was all why did I think this would be a good idea? Then I ran it and I loved it and I was like that was a great idea, let's do this again next year! (Story of my life.) 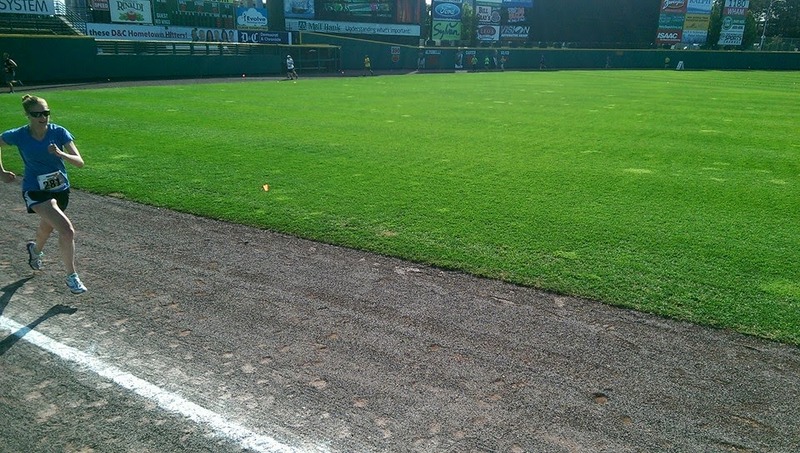 The course was fast and flat and you get to run around Frontier Field to the finish line at third base. It was heartwarming to see all the people wearing T-shirts commemorating their loved ones who suffered from ALS. And I've never gotten a tech t-shirt from a 5K race before, so that was pretty sweet. Plus the shirt is white and the sizes run small so it's perfect for all those wet t-shirt contests you may find yourself at this summer. Thanks to ultrarunner Rob Hannan for the pic! I'm used to running for at least an hour at a time or several hours on the weekends, so a 20 something minute race seemed to fly by. I didn't know if I should try to go all out and race it since that's not really my goal this year, but on the other hand, I can use all the hard workouts I can get before TransRockies, so I decided to run it based on feel. The first mile, I went out easy, keeping myself in check, at a little over 8 minute pace. I felt great and my legs were itching to go faster so at the one mile mark I just took off. I ran progressively faster for miles 2 and 3, sprinted hard at the finish and I still felt like I had a lot left to give. I finished in 23:05 (and second in my age group, surprisingly. I didn't think I was going fast enough for that). I think I could have gone a few more miles at that pace, which is encouraging, but I still have a lot of work to do before we leave for Colorado. To be honest I don't really care about pace or time. I was just so happy to be out there running. I love the fast, short runs and the long, slow runs and everything in between. I love the trails and the roads, but most of all I love that wherever I run nowadays it's with such good company. Lyric of the moment: "This one's for the torn down, the experts at the fall. Come on friends get up now, you're not alone at all...This one's for believing, if only for it's sake. Come on friends get up now, love is to be made..."